Creating a £16m vast armada of robot submarines may seem like an extreme reaction to a movie you saw, but bear with me. 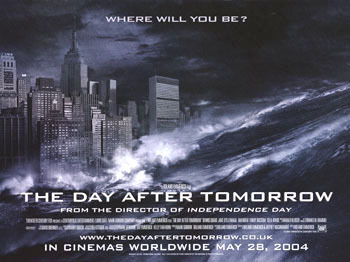 In the recent American film The Day After Tomorrow, a failing Gulf Stream resulted in a much colder UK. Scientists believe that without the Gulf Stream, the UK would be as cold as Canada in the winter. Ports would freeze over while vast blizzards paralyzed the countryside. The Gulf Stream is a "river" of water within the Atlantic ocean; it gets its start in the warm Gulf of Mexico and follows the eastern seaboard of the US before turning east to the UK. The extra heat that the Gulf Stream gives to the UK provides its relatively temperate climate. In Rapid Watch, robot probes will be used to study the Gulf Stream current as they ascend and descend. Robot "gliders" can operate at depths of 3,000 feet; tougher models soon coming online will be able to dive up to 15,000 feet. I'm not very happy with any of the images that I've seen associated with this story; they all look like underwater remote operated vehicles (ROVs) to me. I'm guessing from the description that the underwater armada will be comprised of units more like the Spray autonomous underwater vehicle shown below (read more about Spray: First Underwater Autonomous Vehicle To Cross Gulf Stream).